Top Speed continued with their testing for One Lap of America. 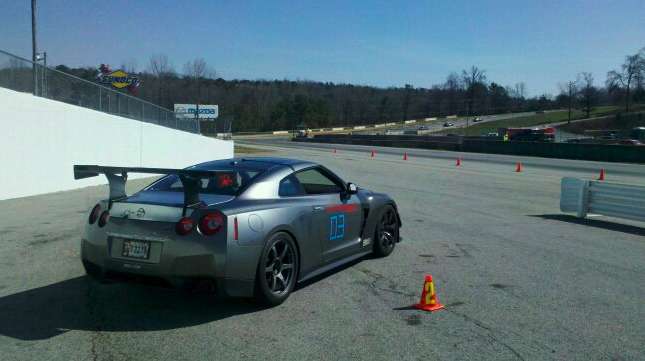 This time they took the trip to Road Atlanta, and jumped into a NASA event. The only open spots were in a HPDE session, so there was a lot of slower traffic. Leh was clicking off times that were about 15 seconds quicker than the rest of the run group. While the testing at Road Atlanta wasn't perfect this weekend do to traffic on track I still feel like we made progress in learning what the car needs. Turn 12 gave us the extreme conditions we needed in order to test the support with the stock shocks, and the esses confirmed the fact that the car still has a bit of aero balance to worked out. We knew going into the weekend that a NASA event wasn't the best place to turn a lap time, but there was progress made, and we had fun! As you can see from the Traqmate data the second lap this session was a 1:30.6. It was actually his first hotlap on Saturday as well as the first time the car had been on Road Atlanta. In turn 6 Leh got hung up by a Mustang that threw his line off for 7 as well. Then coming over 11 there was also a car he had to work around making entry to 12 a little off. We were running the car in HPDE3 & 4 because they were the only groups open on late notice.